Cleaning the oven can be messy. Many of the oven cleaners that you can buy off the shelf at the local supermarket or hardware store are so nasty and messy that many of us would prefer to ignore the problem altogether. But unfortunately this does not make the problem go away and in fact the longer that it is left the worse it is inclined to become. Here is a different solution, some natural ways to clean your oven without the chemicals and the expense and the good thing is that you probably wont have to buy anything you could already have the ingredients in your home. Baking soda is an extremely versatile ingredient and is very underrated when it comes to the things that it is useful for within the home. And one of these is cleaning the oven. This is a very simple solution just mix water with a quantity of baking soda to form a paste that will stick to the oven. 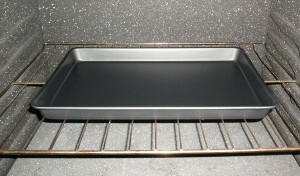 Then cover the oven with the paste and leave it there overnight to work away at the baked on gunk and grime. The next day just use a wet sponge to wipe the mixture away and what was the baked on mess should come off at the same time. This is another method of cleaning your oven naturally that uses baking soda as a base. The first thing you do is lightly sprinkle the dry baking soda on the floor of the oven. Mix a quarter cup of vinegar with three teaspoons of borax , add one eighth of a cup of dishwashing liquid and finally two cups of boiling water. Mix it together and add it all to a spray bottle and spray it onto the baking soda already in the oven. Again leave it in the oven overnight and wipe it with a wet sponge the next day to clean. This method also uses baking soda. Get a box of baking soda, mix in half a cup of salt, a quarter of a cup of borax, a cup of water, three quarters of a cup of white vinegar, 10 drops of thyme and lemon essential oils combined. Make a paste from the borax, salt, baking soda and water. Remove the racks from the oven and heat it up to 250 degrees. Turn the oven once it has heated and carefully, you don’t want to burn yourself, spread the paste onto all of the surfaces in the oven. It will take approximately 20 minutes to set. Mix the vinegar and essential oils in a spray bottle and spray the paste that is hard with the contents. Again you can wipe it afterwards with a wet sponge.